No Fenders -Formula 1, IndyCar and A Whole lot more..: ROLEX 24: Can the 'Ol School Corvettes Win at Daytona in 2019? ROLEX 24: Can the 'Ol School Corvettes Win at Daytona in 2019? ROLEX 24: Come On Down, Who'll be the Next GTLM Entrant to win at Daytona in 2018? Hey, You try analyzing some 50 Bloody Car/Driver/Team combinations; SHEISA! As thee Big Brother Grand Touring Le Mans (GTLM) Class has the second least Competizione, and typically the most stable Driver line-ups, albeit Thars a fair Bitamyte 'O movement this season. With this year's GTLM Scrum once again destined to be another Bloody 'Ol fashion Donnybrook,! Whilst the most intriguing entry will be the #24 BMW M8GTE Coupe with thou legendous' El Zorro' at the controls. 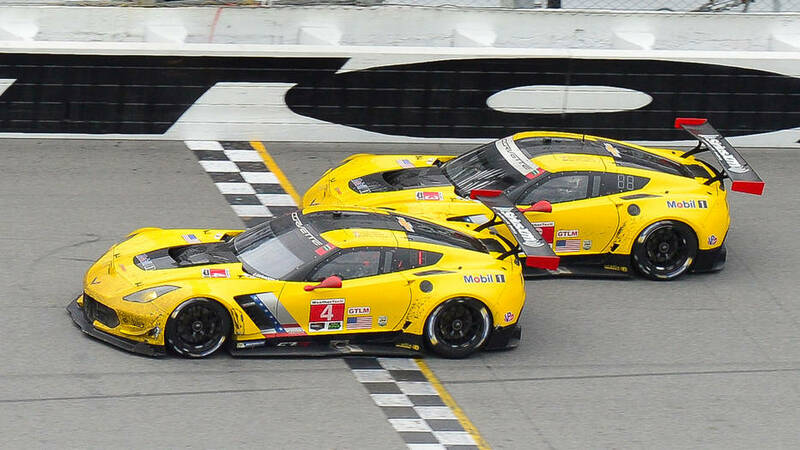 The "General's" kept Thar signature "Fly Yellow" Stingray Vettes' Driver lineups intact a further year, while also soldiering on with the dated C7.R's. As MAGS' (Jan Magnussen) and Antonio Garcia are the Defending GT LM Class Champions. With the two cars retaining past Overall 24 Heurs du Mans winner's Marcel Fassler and Mike "Rocky" Rockenfeller for the endurance events. As the mid-engine runners Porsche, and to lesser extent Ferrari, and especially the "Blown" turbo entries of Ford All seemed to have the legs' upon the Vettes' who haven't won in three years, yet their reliability and precision Pit stops should never be overlooked. Not to mention they've won the Class championship the past three consecutive years, and the drivers surely know their familiar mounts inside 'N out. Yeah, BMW Team RLL is Spearheaded by the very same Bobby Rahal, Dave Letterman and Mike Lanigan of IndyCar Fame, who Debuted the then brand new BMW M8 GTE coupe at last year's Rolex 24. Team RLL retains 50% of last year's Daytona 24hrs lineup, with John Edwards, Connor De Phillippi, Jesse Krohn and Philipp Eng returning. New recruits Tom Blomqvist and Colton Herta need no introducing. As Blomqvist is a former Red Bull Junior Academy Driver, who I've mentioned many times finished ahead of some Maximus Hothead' in Formula 1, nee Max Verstappen in the 2014 European Formula 3 Championship. He's also the son of past Swedish World Rally Champion Stig, who won BMW's "shootout" to replace departing Deutshce Tourenwagen Masters Werks Pilote Joey Hand, where he's spent the past three years racing for BMW. Bryan "High Speed Hurdles" Herta. Who'll be making his full season rookie IndyCar campaign for Harding Steinbrenner Racing this year. Know absolutely Nothin' about Chaz Mostert - Other than he's from Down Under Mates! As the OZ' native competes in the Australian V8 SuperCar series and has won the 2014 Bathurst 1000 Rally, along with the 2010 Australian Formula Ford Championship. Yet All eyes will be focused upon the return of El Zorro', aka Alex Zanardi, whom BMW announced over a year ago would be contesting this year's event in a specially equipped Hand Controls variation of the M8GTE racecar. Once again, Maranello's represented by the lone entry of its latest Prancing Horse, campaigned by Houston's Risi Competizione, as la Scuderia really should at least have another Ferrari on the grid in order to be on equal footing with its competitors. The Driver's lineup remain three-quarters same, with Messer's Rigon, Pier Guidi and Calado returning for another crack at victory. As Davide is a Scuderia Ferrari test driver. And Alessandro's another Factory Ferrari Driver whilst James is the only Bloke from thou Bloody UK. With Spain's Miguel Molina the sole newcomer on the squad. As Molina is a former Audi Deutsche Tourenwagen Masters driver (DTM) making his Rolex 24 Debut, who replaces the departing Toni Vilander, who's driving for Scuderia Corsa aboard their #63 GTD Ferrari entry. 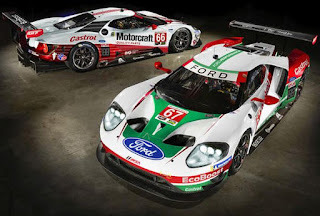 Chip Ganassi returns as the Defending GT Le Mans Class winner, going for an unbridled Hat Trick; Err Three-Peat' this year, aiming for Thar third consecutive W', effectively being thou "rubber Match" between the two entries. As the #66 & #67 have won one Rolex 24 apiece. As Cheeps' regular contingent 'O IMSA Sports Car Aces are all back. Joined by Thar usual Duo of current IndyCar chauffeurs, with Ganassi's Number One Man, 5-times IndyCar Champion Scott Dixon in the No. 67, the reigning GT LM winner. Whilst le Hamburgular', nee SeaBass', whom I now call Sealmeister B', aka Sebastain Bourdais tinkles thou No. 66's "ivories." Like BMW, Porsche now has a year's racing experience underneath it's Belts; Err Bonnet with Thar latest iteration of the venerable 911 racing platform. As was surprised to discover when learning the most I've ever known about CORE Autosport, that they're also running the two car North American Porsche GT Le Mans Factory programme alongside Thar B-I-G BOYZ' Nissan DPi Prototype effort, all housed in Rock Hill, South Carolina. Won't repeat my Messer Tandy being the meat in le Ménage Twah between Pilet and Makowiecki; Hya! Joke here. As it appears the only Driver change between the two Porsche's is Gianmaria "Jimmy" Bruni being slotted out for French newcomer Mathieu Jaminet instead.